A peek into the life of a London cabbie this week as we catch up with the Cabbie Blog – who unsurprisingly isn’t short of a few opinions on our city! If you had to describe your blog in less than 15 words how would you do it? 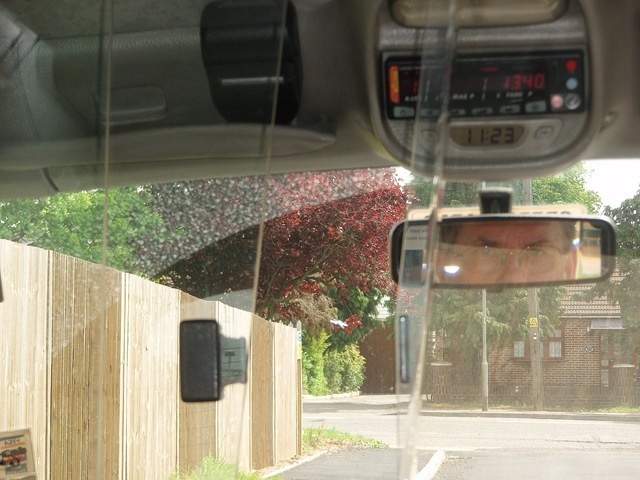 A London Cabbie’s slant on the iconic “Disgusted of Tunbridge Wells”. How and why did you start blogging? What about London inspires your blog? London cabbies spend an unhealthy amount of time on their own, in a space smaller than a telephone box. We have ample time to ruminate on London’s shortcomings . . . and its greatness. Look, when I first worked in London eighteen years after the war it was still a bombsite. We had started building the modern crap that used to surround St. Paul’s. Now in a more enlightened age we still allow London to be despoiled by the likes of Tower Bridge House built adjacent to a World Heritage Site, just because it’s designed by architects with an international reputation. While only 600 yards away a little gem like Wilton’s Music Hall, the oldest music hall in the world falls into disrepair, Tower Hamlets Council should be ashamed. Sorry rant over, I feel better now. You’ve had some great celebs in your cab – any good stories to tell about them? I have a full list on my blog, with a pithy one liner for each. But if you insist; I picked up Tony Blair’s head once from No. 10, pity it was only a bronze bust, I suppose he just wanted to gaze at himself. Last July the Monochrome Man from No. 11 (Alistair Darling) got in; we had a short but incisive discussion about my pension. But I suppose my piece de resistance for dinner party conversation is having Grayson Perry in the cab. Who is Grayson Perry I hear you ask, well for you philistines, he’s a Turner Prize winning potter. Oh! Yes, nearly forgot Grayson Perry is also a transvestite and always dresses on a variation of Alice in Wonderland. And what celeb would you love to have? Tony Blair. On the journey the cab’s central locking would jam, and we could have a long conversation about Tony’s failure as a Prime Minister. What’s life like for a London cabbie in 2009? Are things getting better or worse for the profession? Do you really want to listen to me pontificating on cabbie’s woes? Well, OK if you insist, business is down but it could get a lot worse, if it does I might have to sell the villa in Tuscany. Seriously the real problem for us is Transport for London, who in their right mind would allow rickshaws to carry children around London’s streets? They are dangerous – period. Also road works, why can’t they get the utility companies to fill one hole before starting another? My advice to anybody thinking of starting the Knowledge, it’s not as glamorous as it looks and you have to work unsocial hours to earn a decent living. But it is the best part time job in the world. What do cabbies know about London that on one else does – what do they get to see? We know that if you ask the concierge at many hotels for a cab to take you to Heathrow, you will get his brother-in-law, and not a proper cab. What makes a London cabbie happy? And what are the top cabbie bugbears we should avoid? Give us regular work, not boom and bust, sorry Gordon. Be polite, it doesn’t take much. State your destination making sure the cabbie understands which “King Street” you actually want. Don’t just give a postcode, I was never asked about postcodes on The Knowledge. Don’t eat in the cab or put your feet on the seats. But if you really want to upset me, try continuing talking on your mobile at the same time we are having a conversation. Would you feel more connected to London, would you have missed out on things without your blog? Most cabbie blogs are very introspective “my mate had a puncture yesterday” or “I had a dodgy curry at the Astral Café last week” (the food is great there, by the way). I wanted to show on my blog what American tourists are always saying about us, that London cabbies can give informed opinion (with a right wing bias naturally), know London and well, speak English. Writing my blog has opened my eyes to London’s diversity. It’s an old cliché, but London really is a collection of villages, each with its own personality. And while I drive around finding things to whinge about, I’ve discovered places like Little Green Street. My antithesis, Jane’s London, while I comment on the many facets of London that annoy me, Jane photographs the visual delights that London has to offer; signs, boot scrapers, lights, you name it. Another is Faded London photographs of old painted adverts on walls, from a bygone era. Also the best blogger on the web for cabbie miscellanea Richard Cudlip’s The Cabbies Capital. And for London at its most eccentric Brian Pigeon’s barking (or should that be cooing?) mad site that does what it says on the tin. And for some general London chat . . .Where do you live and why do you love it? I was born in Fitzrovia (always sounds good when asked), but spent my young life in Cockfosters. But I now live north of Romford and have been a cabbie for 11 years. In a previous life I was a typesetter, so all of you at Londonist.com, I will be checking for typos. Near where I live there are many woodland parks, and Bedford’s Park has views across the Thames valley to Crystal Palace, it makes you appreciate just how great this city really is. You mean of course apart from St. Paul’s Cathedral, which is the best building in the world. Well, if you promise to keep it to yourself, I love the view across the river from Bankside, with the Globe Theatre, Tate Modern, Millennium Bridge and the Anchor Inn. When I have made my fortune, I want to buy the house called The Cardinal’s Cap there, they claim Wren stayed there when St. Paul’s was being built, all tosh, but a great story. Gillian Tindall in her book, The House by the Thames, describes this part of London perfectly. Have you ever been sick on the tube? Do I really look like the sort of person who frequents the tube? I will blog about anybody who tries to turn this world class city into a mediocre town, so just watch your back. I think my blog “Festival of Litter” sums up my despair on how Londoners are apathetic towards what’s happening to their great city.